Addressing experts, Governments, and other participants at the Intersessional Expert Meeting on the full enjoyment of human rights by all women and girls and the systematic mainstreaming of gender perspective into the implementation of the 2030 Agenda, Ambassador A.L.A. 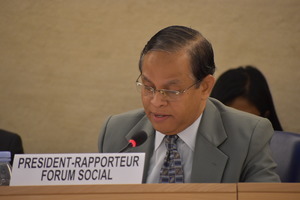 Azeez, Permanent Representative of Sri Lanka to the United Nations in Geneva stated “It is incumbent on all stakeholders to strive to create a culture of respect for equality and non-discrimination and to work towards dispelling the myth of inferiority attributed to women over centuries”. He called for all stakeholders to work together to ensure a dignified life and a better future for all women and girls. The Intersessional Expert Meeting began its two day session in Geneva today, with the opening remarks of Ms. Kate Gilmore, Deputy High Commissioner for Human Rights, followed by presentations by experts representing different UN agencies and an interactive dialogue. He emphasized that ensuring access to quality health services and quality education would significantly improve life chances and better employment opportunities for women and girls. “Such empowered women and girls can bring transformational improvements in the health and prosperity of families, communities, societies and nations they live in”, he remarked. Sharing the experiences of Sri Lanka in recent times, he outlined the measures taken by the Government to address challenges faced by women, such as the adoption of a National Action Plan for prevention of gender based violence (GBV) and the National Human Rights Action Plan (2017-2021) as well as the enactment of legislation aimed at increasing women representation in local governing authorities. Sri Lanka’s Permanent Representative reiterated that achieving gender equality was not just an issue of women and girls, and that it went way beyond, calling for the active involvement of all stakeholders. 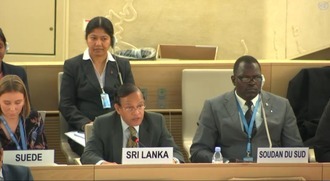 Sri Lanka says ‘In Development Dialogue, Addressing poverty and other constraints in imperative’. While individual States have the primary responsibility for national development, the need for further collective efforts and collaboration, between States and between numerous stakeholders, in addressing poverty, disasters, conflicts and health hazards are imperative, Sri Lanka said on 23rd April 2018, addressing the General Debate of the 19th Session of the Working Group on Right to Development (RtD). 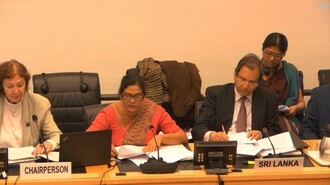 Sri Lanka’s Delegate Minister Counsellor of the Permanent Mission of Sri Lanka in Geneva Ms. Shashika Somaratne, while taking note of the progress made so far by the Working Group, reiterated the call for finalizing as a matter of urgency, the criteria and the operational sub-criteria, which are being under negotiation since 2010. In this context, she drew attention to the proposal by the Non-Aligned Movement (NAM), on a set of standards regarding the implementation of the Right to Development and the non-paper aimed at finalizing the consideration of the criteria and sub-criteria with a view, to facilitate the process. In this context she further said that in Sri Lanka, the Government through its “Vision 2025 : A Country Enriched” policy document, has now launched a comprehensive framework to alleviate poverty, address regional disparities within the country, and promote prosperity to all its people, with a view to ensuring the holistic realization of Human Rights while implementing the 2030 Sustainable Development Agenda. 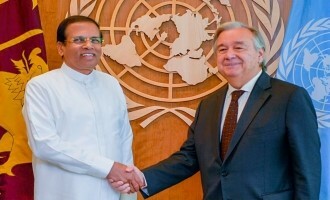 In addition, the Sustainable Development Act has been enacted by the Parliament in October 2017, and Sri Lanka will share its experience during the June 2018 High Level Political Forum (HLPF) of the ECOSOC in New York, by submitting its National Voluntary Review (NVR), on “Transformation towards Sustainable Resilient Societies”. 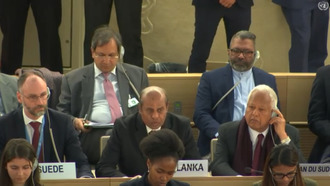 The adoption of the Universal Periodic Review Report on Sri Lanka took place this afternoon at the Human Rights Council in Geneva. 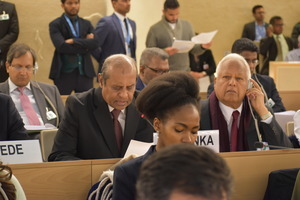 Sri Lanka was represented by Permanent Representative Ambassador Ravinatha Aryasinha and assisted by the Deputy Permanent Representative Mrs. Samantha Jayasuriya. Third Cycle of Sri Lanka’s Review at the 28th Session of the Universal Periodic Review (UPR) Working Group is being held on Wednesday, 15 November 2017 in Geneva. The Sri Lanka’s delegation to the review is led by the Deputy Minister of National Policies and Economic Affairs Dr. Harsha de Silva. 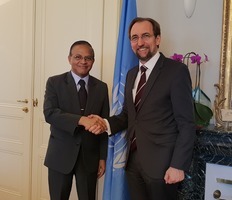 The delegation comprised of officials from the Ministry of Foreign Affairs, the Attorney-General’s Department, the President’s Office, and the Permanent Mission of Sri Lanka to the UN in Geneva. Concluding Remarks made by Hon. (Dr.) Harsha De Silva ,MP, Deputy Minister of National Policies and Economic Affairs. Mr. Prasad Kariyawasam , Secretary Foreign Affairs made interventions on Torture, Office of the Missing Persons and Transitional Justice. Mr. Nerin Pulle, Deputy Solicitor General at the Attorney General’s Department made interventions on Hate Speech & Minority Rights, Sexual & Gender based Violence, LGBTIQ and Persons with Disabilities (PwD). Ms. Chandima Wickremesinghe, Senior Assistant Secretary to the President, made intervention on Sustainable Development Goals (SDG). The Universal Periodic Review (UPR) is a process in which the human rights records of all 193 UN Member States are reviewed periodically. It was introduced when the UN Human Rights Council was created by the United Nations General Assembly Resolution 60/251 of 15 March 2006, and it was adopted unanimously by all UN Member States. Under this process, the human rights situation of all member countries of the UN is reviewed every 4.5 years. The UPR is a State-driven process. Each State is given an opportunity to declare what actions have been taken to improve the human rights situation in a country and to fulfil their respective human rights obligations. The UPR is designed to ensure equal treatment for every country when their human rights situations are assessed. The ultimate aim of this mechanism is to improve the human rights situation in all countries and address human rights violations wherever they occur. 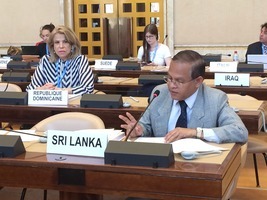 Consideration of the Fifth Periodic Report of Sri Lanka under the Committee on Economic, Social and Cultural Rights (CESCR) took place at the 61st Session of the Committee on Economic, Social and Cultural Rights, held at the Palais Wilson in Geneva, on 8-9 June 2017. 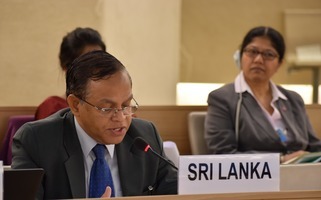 Ambassador Ravinatha Aryasinha, Permanent Representative of Sri Lanka to the United Nations in Geneva led the Sri Lanka delegation and introduced the report. Ambassador Ravinatha Aryasinha, Sri Lanka's Permanent Representative to the UN in Geneva delivered the Statement on behalf of the Government of Sri Lanka as the country concerned during the Clustered Interactive Dialogue with the Special Rapporteur (SR) on the Independence of Judges and Lawyers, Mr. Diego García-Sayán, at the 35th Session of the Human Rights Council today (12 June 2017). 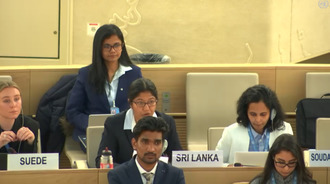 The Statement followed the presentation of the Report (A/HRC/35/31/Add 1) on the visit of previous Special Rapporteur on the Independence of Judges and Lawyers, Ms. Mónica Pinto to Sri Lanka from 29th April to 7th May 2016. 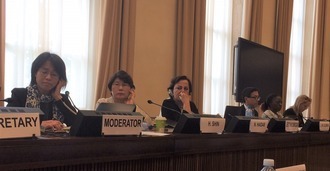 Sri Lanka's Permanent Representative to the UN in Geneva Ambassador Ravinatha Aryasinha has emphasized the need to fully utilize the holistic normative framework that the Right to Development provides in the realization of the 2030 Sustainable Development Agenda. 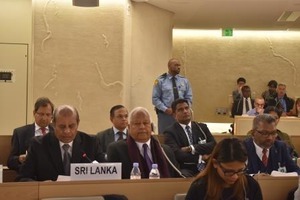 While affirming Sri Lanka's continued support to the Intergovernmental Working Group on the Right to Development, he also highlighted the need for early finalization of the draft criteria and sub-criteria enabling the operationalization and realization of the Right to Development at the international level. 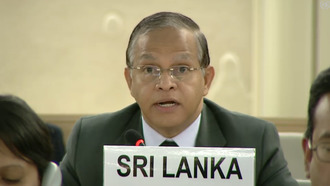 Ambassador Aryasinha made these observations when he delivered Sri Lanka’s statement at the 18th Session of the Intergovernmental Working Group on the Right to Development today (03 April 2017) at the Palais des Nations in Geneva.